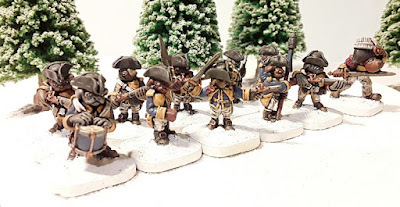 Those of you who read my last article will know that I'm currently working on some cavalry for my Flintloque forces. They are coming along well and will be the subject of a future article, but then an email arrived in my in-box about the next Alternative Armies release................Dogmen Pugs! Following the vicious Haarausfall War against the Confederation of Finklestein, and despite the fact that the Ostarian Forces were victorious there were some Pugs who defected. While in Ostaria they were ridiculed for their size they hoped for better treatment amongst the various races in the Confederation. They were welcomed and allowed to set up the town of Pugglesberg but as former enemies were understandably treated with some suspicion. Hanz Wolfe, a captain in the Finklestein Dogman Regular Infantry was impressed with their confidence and strength and when Finklestein sent forces to the Witchlands he raised the 1st Pugglesberg Jagers at his own cost. The Pugs were happy to join up and prove their worth. All went well at first. There is continual banter between units in the Finklestein forces due to their diversity, and despite being given the nickname of the 'ankle shredders' by the regular Dogmen, the 1st Pugglesberg Jagers fit in well. 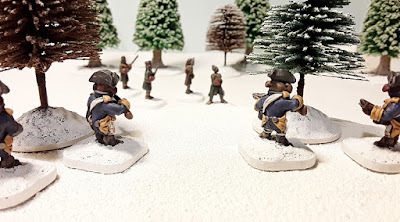 All units struggled in the cold and snowy conditions of the Witchlands but it was after the retreat from Moscova started that things went wrong. Due to the deep snow the Pugs couldn't keep up and were left behind. Captain Wolfe kept his troops together but despite seeing off regular attacks by Graviski Line Infantry and Zombiski Cossacks their numbers were slowly reducing. It was at this point when all seemed lost that they were assisted by an unlikely source. 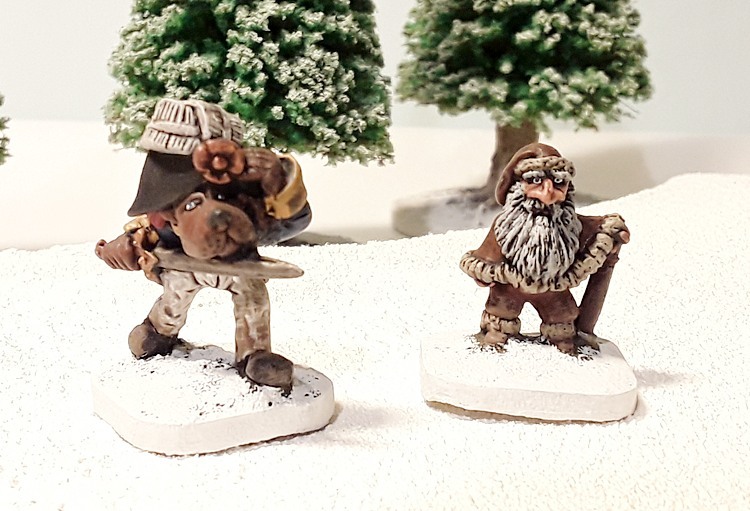 They came across Johan, a Dwarf Woodsman who had been acting as a guide for the Ferach forces but who had been knocked unconscious in a skirmish and left for dead. They brought him into their camp and gladly shared their dwindling rations with him. In return he has shared his considerable survival skills with them and shown them how to set ambushes for the dead. Their favourite trick is to use their small size to hide in snow drifts, allowing the enemy to get really close before unleashing a devastating volley. The tables had turned! Captain Wolfe (Section Leader) is an Experienced / Regular / Elite Dogman armed with a sword and standard pistol. He has the traits Quick Reflexes and Nerves of Steel. Johan is classed as a Dwarf Veteran / Light trooper armed with an axe. Due to his skills as a Woodsman if he is outdoors and uses a slow march or a half step march he cannot be seen by an enemy over 30cm away. 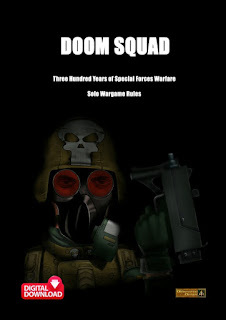 For the Pugs I use the stats for Dwarf Regular Infantry as is recommended for Von Mohnblume Ostarian Pug Infantry. They have a Lieutenant (second) armed with a sword and standard pistol, a sergeant with a halberd, a standard bearer, a drummer and the troopers are all armed with Dwarf MkII Muskets. Their uniforms consist of dark blue tunics, white breeches, a black tricorne and black shoes with gold buckles. The facing colour is yellow. Their equipment is black with straps of white leather. Special deployment: To play an ambush scenario with the Pugs concealed in the snow I use round counters to represent the Pug force lying in wait (I put a number on the underside so that I know which is which but my opponent doesn't). They count as in heavy cover until they fire or move, or until they are hit by enemy fire or charged. This is to represent how well they are hidden rather than the protection given by the snow itself! The hidden rules work well against undead infantry as they are generally not very good at shooting and slow to advance. I like to let the enemy get close before making an Aimed shot with the Pugs. You have to be careful about letting them get too close though in case you miss and because zombies can take a bit of damage and keep going! I tend to use them in teams of two, both firing at the same target. 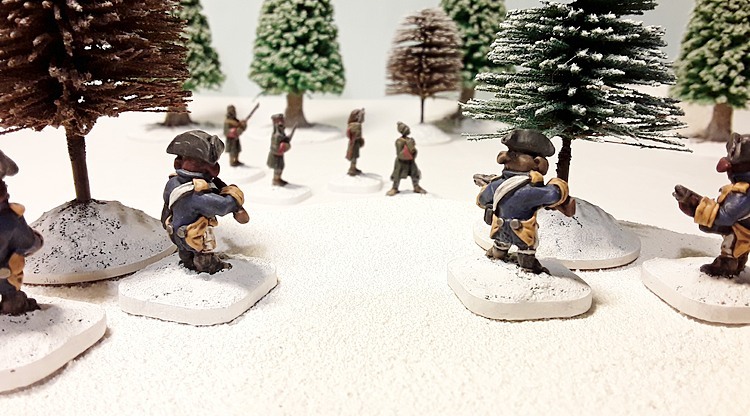 As a precaution Captain Wolfe and Johan are kept behind the main line and can pile in to help finish off the enemy that survive in close combat! By using the stats for dwarves, they are not the quickest but can stand their ground against the Dark Czars forces. Using their hidden deployment is fun and something different to try as part of a larger force either as the vanguard, rearguard or perhaps guarding a flank. 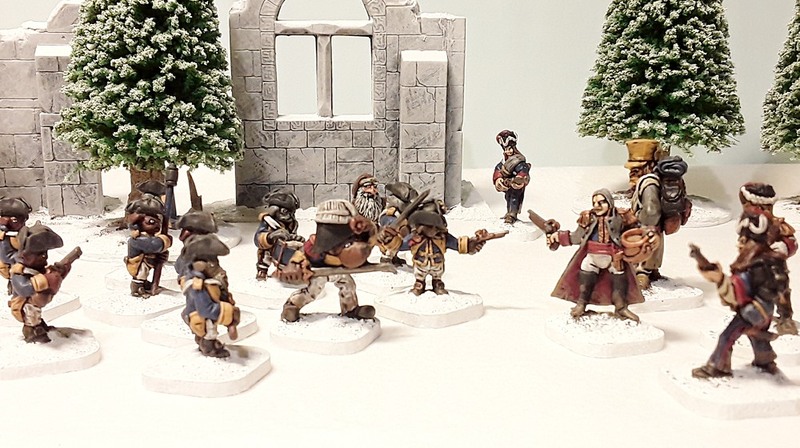 These look most excellent, the white bases and table make a great background which only enhances the paintjob. A well staged pictures and story too. Thanks. I will pass that on to Andy for you. He really enjoys playing Flintloque.